Hi-Rise Industrial Shelving – Canadian Rack Inc.
Canadian Rack is a VAR for Metalware Hi-Rise shelving. 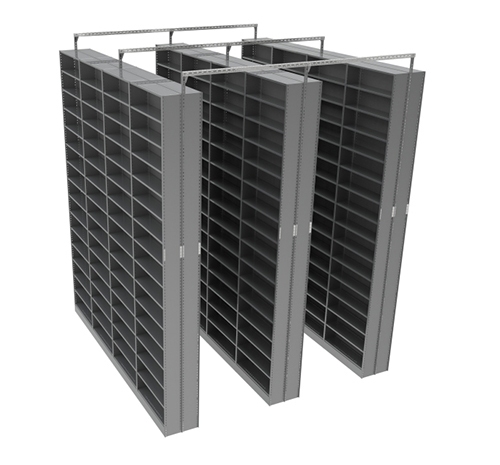 High-rise shelving, available in heights exceeding 20 feet, is a special application for maximum cube utilization. It utilizes the total space available while minimizing the floor-space required. These types of installations can be built out of shelving or wide span systems depending on your requirements. Mechanical picking equipment may be required. Slice Bracket – Splice brackets, sold in pairs, are used on posts or end panels to tie the 2 uprights together. Creating additional height to one system, all the whole reducing shipping costs. The splices come with the hardware to secure them to the posts or end panels. It is necessary to use the proper foot plates when building a hi-rise shelving unit. Foot Plates – Galvanized foot plates are used to anchor the posts or end panels to the floor. Anchors are not included. Each foot plate comes with a special short shelf clip to allow you to place the shelf in the same position at the bottom of the unit. Foot plates are available in different thicknesses to accommodate seismic requirements. Top Ties – Top ties are necessary when exceeding the 6:1 ration – where the depth x 6 is more than the height of the unit. Top ties can be flush mounted or extended above the last shelf to accommodate for equipment clearance.